The Flying Mantis is a lightweight carbon easy foiling trimaran for the solo sailor. It is designed to deliver windsurfer flexibility and be transported and sailed almost anywhere. The Flying Mantis is two beautifully designed performance boats in one. 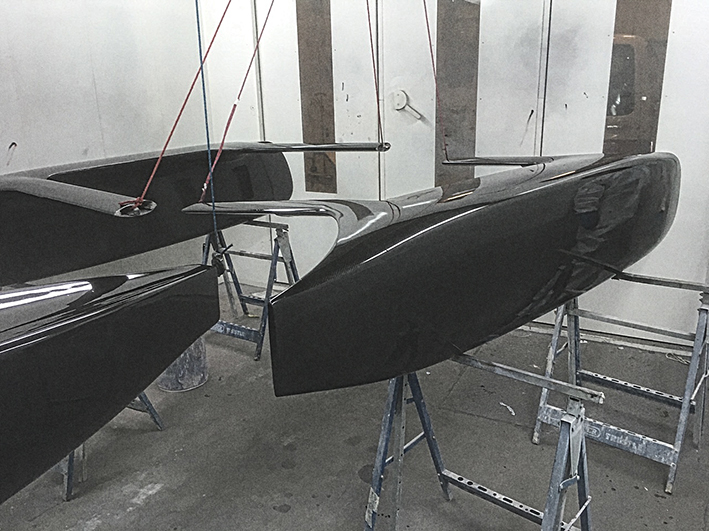 It can be switched between a semi-foiling displacement trimaran and a full-foiling version depending on a sailor’s skill and sailing conditions. The Flying Mantis boasts a lightweight carbon epoxy foam sandwich construction. The hulls are quick and simple to assemble. The central hull weighs around 20kg plus outriggers at 12.5kg. Fully assembled, this lightweight trimaran is especially suited to taller & heavier sailors, with a weight range of up to 120kgs. The Flying Mantis was conceived by Simon Chrispin, owner of It Should Be Fun Ltd (ISBF) which is marketing the boat. “I wanted a boat that I could keep at home, put on the top of my car and launch from any beach. It had to be super lightweight and portable…..oh, and it had to go fast or it would not be fun”. The most efficient boat form that met the requirements turned out to be a trimaran. Simon met two boat builders at the 2016 RYA Dinghy Show, Jamie Stewart (naval architect) and Anthony McMahon (owner of Solent Boat Works), specialists in the build and repair of carbon performance craft. By coincidence, they had a draft design for a performance trimaran which Jamie had worked on with Richard Pemberton, designer/technical consultant to teams in events such as the America’s Cup, Volvo Ocean race, Vendee Globe race, Olympics and the World Speed Sailing Record. The idea of foiling capability was added to Simon’s concept and the Flying Mantis was born on Hayling Island where it is being built by Solent Boat Works. Visit us on stand C86 at the RYA Dinghy Show, 4th and 5th March to meet the team and where deposits will be taken to secure build slots.